What can one say about something as diverse as a festival that celebrates the idea of getting along with one another? Not much except that it’s frickin awesome. Having had the FM4 Rap Against Festival before in Vienna, it has managed to out-do itself this year by adding the frickin awesome idea of putting in an Ex& Hop Contest. Ex&Hop? What?! What is this Ex&Hop? Come on kids, rack you’r brains. It’s exactly what it says on the tin. 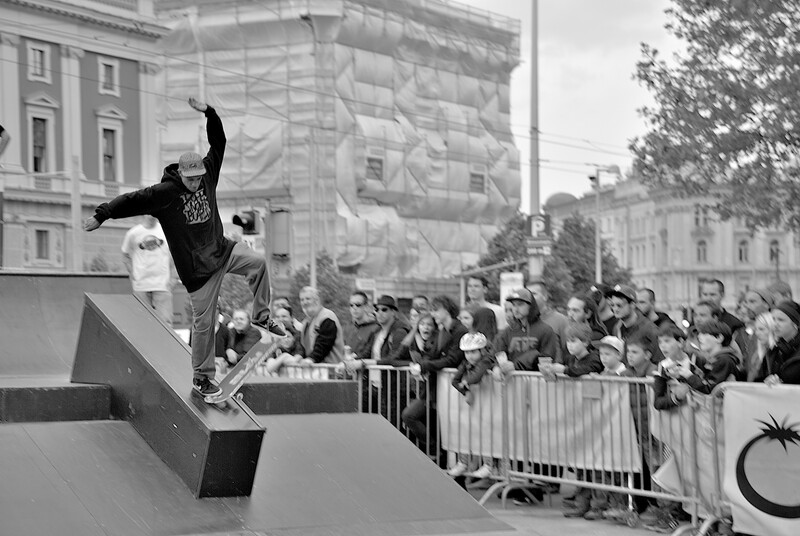 A BMX and Skate Contest. What?! Yep, they fused it into one contest…. I pretty much know it’s a first for the Shuvit Crew to cover, that’s for sure. For as far as I can try and remember, especially writting this on a Sunday; when was the last time I have ever seen something like this in Vienna? I can pretty much say never. 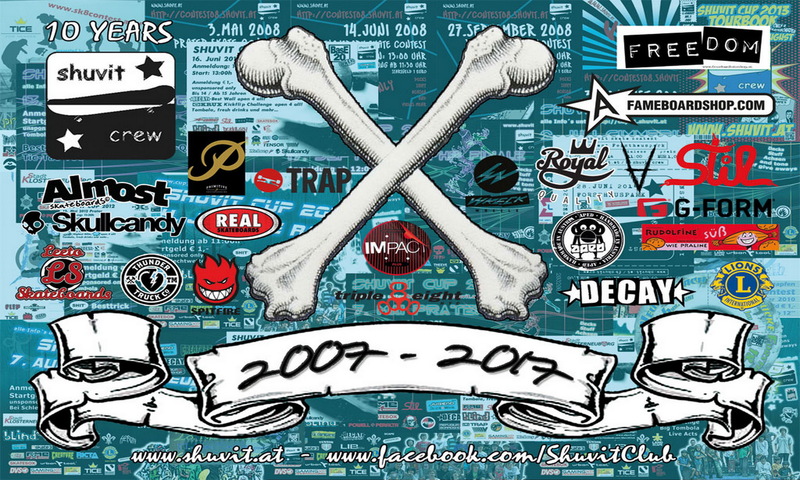 The fusion of BMX and Skate, with rap, graffitti and social awakening is a new given. What a mix. What an honour. Thank you guys! The weather held, and as did the hosts with their nerves. I got there on Wednesday and saw them putting in the final bolts on the obstacles in the afternoon, just a few sweet hours before the contest was supposed to kick-off. While the BMX boys were getting their groove on. And even though one was busy bolting down, while a BMX kid alomst killed him, hell, they held their cool. Then I heard that Vienna gave them 30m2 less play area than promised. So they had to compromise. And they did. Yes, the track was more dodgy, but hell yeah, let’s face a challenge right?! And while this was happening, you have to imagine that not so far away there were graffitti artists getting their spray on, and the most talented local artists getting their lyric on. 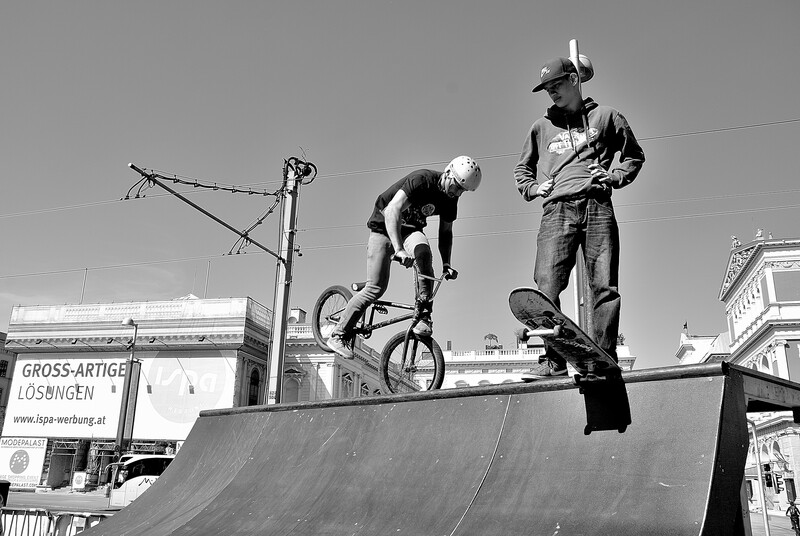 What I found more interesting was the way the BMX riders and Skaters got along. Most times you hear the groups dissing each other behind their backs and giving the evil eye. But not this time. It was literally a round of high-fives and motivation. If there was a collision between the two, they helped eathother up and carried on. I kinda started to get why this collab was presented at a festival for diversity. Just saying in terms of the Skate versus BMX hate cliche here …. There was none. But my personal fave day was Day 2, having warmed up from the day before, every rider was DTFR (down to f#cking ride). You could smell it in the air that they tasted blood and sweat (and perhaps beer) the day before, and they were out for more. And this showed. 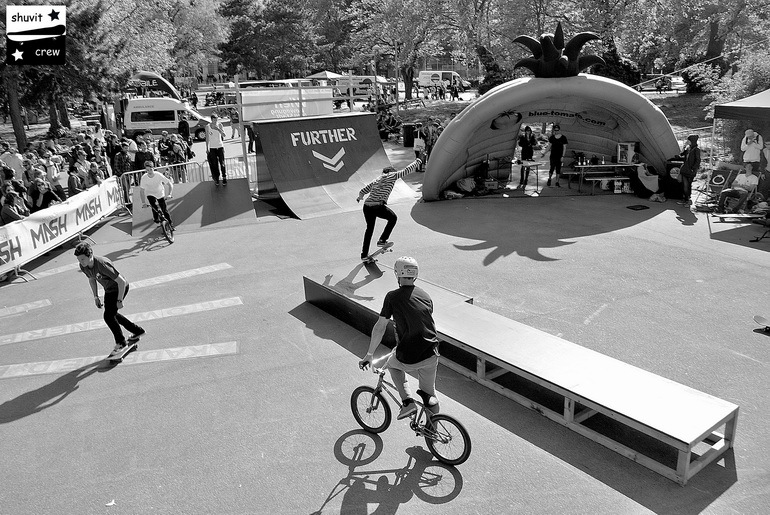 Higher airs, longer grinds, harder slams. They wanted it, and the crowd loved it. It was not just a contest, it was a show. Tourists and locals were left open mouthed with the stunts and tricks all the kids were pulling. It’s pretty hard to describe in words what was going down in terms of atmosphere. But if I had to put in one word (or something close), it was f#cking awesome. And did I mention that the weather held? It didn’t rain until about an hour after the contest finished. Even though it bloody well looked like it was about to pour down the whole time. Karma was on our side. And why? Because it the whole thing was taking place for all the right reasons. PS: Can you come back next year? Wanna see what was up? Then check out the pix. Perfekter Bericht! Ist besser als gut geworden!